An ethos of generosity guides the MFA Writing Program at Sarah Lawrence—a belief that thriving as a writer can go hand in hand with helping other writers thrive. Sarah Lawrence's MFA Writing faculty members are both distinguished writers and devoted mentors. At the heart of our program are bi-weekly, one-on-one student-teacher conferences, in which our faculty engages with your work in depth, accompanying you every step of the way as you explore the possibilities of your art. Our vibrant community of writers features monthly student readings, the student-run literary magazine Lumina, and a student-run annual poetry festival, as well as our literary colloquium, a weekly series of talks by faculty members, visiting writers, and publishing-industry professionals. Students may concentrate in Fiction, Poetry, Nonfiction, or Speculative Fiction, but during their time in the program, all students are permitted—in fact, encouraged—to take classes in any of the genres we offer. Students choose to concentrate in fiction, creative nonfiction, or poetry. Each semester, full-time students participate in a workshop and a craft class and attend the literary colloquium. In workshops, students practice their writing and receive thoughtful feedback on their work. During their course of study, they take four workshops, usually with four different writers. This encourages students to explore an array of perspectives and techniques. Each student meets bi-weekly with workshop faculty in one-on-one conferences. In craft seminars, students discuss published writing and learn to read as writers. Taking a workshop in another genre is permitted; taking craft classes outside one's genre is not only permitted but encouraged. Sarah Lawrence MFA students can take full advantage of the College's proximity to the New York City literary scene. One of the program’s distinguishing features is our conference system: bi-weekly, one-on-one meetings between student and workshop teacher. In these half-hour conferences, students and teachers talk about student work in great depth and detail. They also explore wider questions in conference. Whether a student wants to talk about the mysteries of art or the mechanics of publishing, no literary topic is off-limits. Through these ongoing conversations with teachers in conference, students gain a stronger sense of their own literary aspirations and of the possibilities of the writing life. The MFA literary colloquium is a weekly series of talks given by writing faculty members, visiting writers, and publishing professionals, touching on every aspect of the writing life. Recent speakers have included Reginald Dwayne Betts ("The Craft of Poetry"); Eula Biss ("Writing from Information, Metaphor, and Lived Experience"); Vivian Gornick ("On the Joy and Peril of Rereading"); Henry Dunow ("Advice from a Literary Agent"); Garth Risk Hallberg ("A Second Self: Fiction as a Vocation"); Hua Hsu ("The Identity of the Critic"); A. Van Jordan ("What Are We Really Talking About? Subtext in Poetry"); Sarah Manguso ("Writing Between Will and Surrender"); and Gregory Pardlo ("Improvisation as a Generative Tool"). Every spring, second-year students have the opportunity to meet one-on-one with literary agents. Students submit query letters and samples of their work beforehand, and at the meetings agents provide responses and advice. Students in the Graduate Writing Program enjoy a wide variety of teaching opportunities. Many of our second-year students teach introductory writing courses at the Purchase campus of the State University of New York, and both first- and second-year students serve as tutors at Westchester Community College. MFA writing students also have the opportunity to work as teaching assistants in colleges throughout the five boroughs of New York City in association with the CUNY Start program. On the Sarah Lawrence campus, three or more MFA students work as mentors every year in the undergraduate Writing Center. The MFA Writing Program also places students in teaching positions in local high schools and prisons. And through Sarah Lawrence's non-credit Writing Institute, four or more of our second-year MFA students teach writing workshops in local libraries. Each year, a guest writer from each genre—fiction, poetry, nonfiction, and speculative fiction—spends two days on campus giving master classes, lectures, and readings. Past resident writers have included the poets Mary Jo Bang, Mark Doty, Mary Ruefle, and Tracy K. Smith; fiction writers Charles Baxter, Michael Cunningham, Jonathan Lethem, Lorrie Moore, Caryl Phillips, and George Saunders; and nonfiction writers Geoff Dyer, Dave Eggers, and Phillip Lopate. The resident writers for the 2017-2018 academic year are Bhanu Kapil (poetry), Ben Lerner (fiction), and Victor LaValle (speculative fiction). Our nonfiction resident will be named later this year. The annual Sarah Lawrence Poetry Festival is the largest free, student-run poetry festival in New York State. 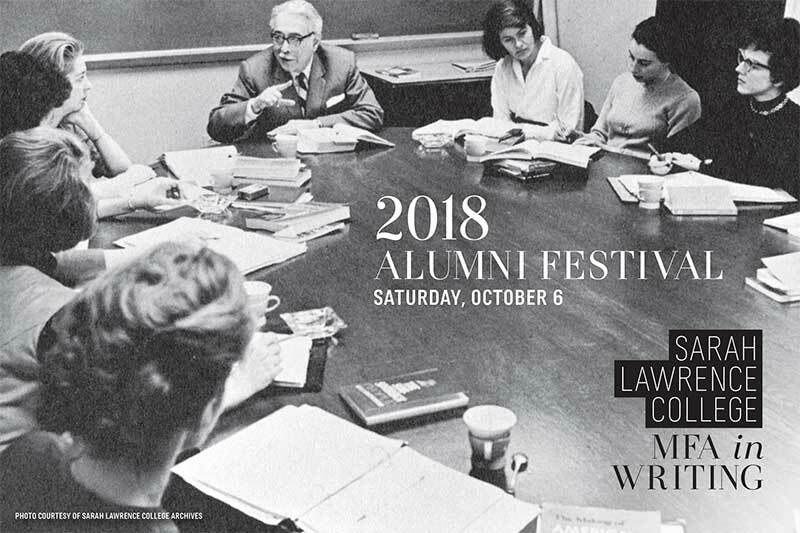 The festival is organized by members of both the MFA Writing Program and the undergraduate class at Sarah Lawrence. Graduate writers come together to read their work at the monthly Happy Hour in the Slonim House living room, in a casual atmosphere where refreshments are shared while students read. One faculty member reads at each Happy Hour as well. A few days before commencement, writers from the graduating class read from their culminating body of work in a formal setting. Families, friends, faculty members, and writing peers are invited to attend the graduate thesis readings. Assistance for students in our Graduate Writing Program is available through three scholarships: Grace Paley Scholarships (for fiction writers), Jane Cooper Scholarships (for poetry writers), and Randall Jarrell Scholarships (for nonfiction writers). More than half of Sarah Lawrence's graduate students work on campus in a variety of positions: as research assistants for undergraduate faculty; as assistants in the Writing Program; in the college library or financial aid office; and in other sites on campus. Each year, three MFA writing students serve in paid positions as mentors in the undergraduate Writing Center. A total of 40 course credits is required to receive an MFA in Writing. The program can be completed on a full-time basis in two years or part-time in three years or more. Thank you to everyone who joined us for the Fourth Annual MFA in Writing Alumni Festival on October 6! Check out a recap and photo gallery!